Having been born in 1997, on March 19, Alexandros Malis's age of 22 makes him junior to the average player of Panaitolikos. So far in the 2018/2019 season, Alexandros Malis competed in 17 fixtures. Greek, Modern (1453-) defender Alexandros Malis, who is currently under contract to Panaitolikos in Greece, joined the club July 1, 2016. In Super League (Greece), Panaitolikos is in seventh position and in Greece Cup (Greece) of group Gr. 3 they are in third place. In terms of winning, his team was able to do so in 40% of Super League's and in none of Greece Cup's matches. Before joining Panaitolikos, Alexandros Malis was not engaged in the squad of another professional team. Throughout his professional career, he participated in 18 games, the last appearance being ten days ago. He plays with the jersey number 47. Alexandros Malis's longest stay in a team counts two years and 10 months in his current club. The briefest time his spent on a team counts eleven months in his present club. His portfolio includes one accidental own goal, which happened with Panaitolikos in a match of Super League 18/19 (Greece). After an overall look at his career, we can see that Alexandros Malis was substituted in four times but never out. In the active season, he came into the park more often in contrast to 2017/2018 wherein both types of substitutions were balanced. 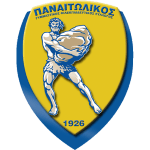 Besides Alexandros Malis, there are seven more defenders in Panaitolikos'' lot: Nikolaos Marinakis, Pedro Amaral, Alexandros Parras, Arghus, Enea Mihaj, Dimitris Gianniotis and Georgios Liavas. To date, collectively he holds five penalties. Lately, he seems to be more quiet since less penalties were given to him than usually.